It's that time again. Earlier this month I signed up for my third Bead Soup party. 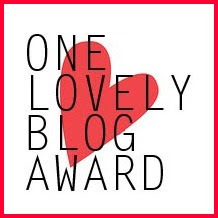 For those of you just joining in, two to three times a year Lori over at Pretty Things, our hostess with the mostess, pairs participants from all over the world to participate in this challenge. 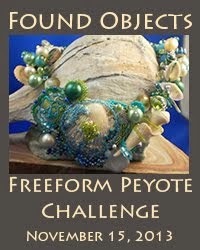 Then each pair exchanges a package of beads which we then must use to create a new piece. The goal is to work outside your comfort zone with components you did not choose for yourself. And to share in the fun of watching others do the same. This time around, I am fortunate enough to be paired with Judy Riley of Three Red Beads. Judy's work has a wonderful, organic nature that appeals to me greatly, inspired as it is by the natural world. A woman after my own heart! 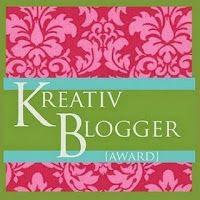 Absent from the designing and blogging community while she worked on her Masters degree, Judy's now back and ready to roll. Doing a little searching on her blog, I found this lovely piece at right. 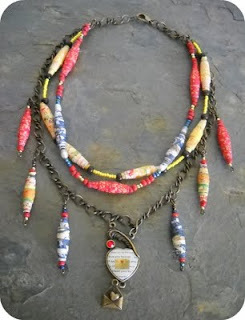 Inspired by the song Mystery by the Indigo Girls, it includes her handmade paper beads; blue for the moon clouded, red for the sun, and yellow for the colors of summer. When I asked how she'd gotten into beading, she replied, "I started out when I was young doing a lot of crafts like many other people, found and loved beads and have worked with them since." Sound familiar? It's interesting how for so many of us, an early introduction to crafts by a friend or family member made all the difference. Now we're both waiting (impatiently at least on my part) to receive our Bead Soup ingredients. While we're not supposed to show what we've sent until our partner receives her package, we're encouraged to share teasers. Just to whet the appetite you see. 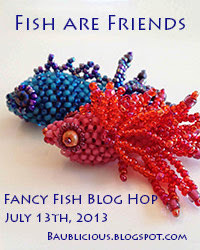 Stitch Until Done: my collaborative effort using JJ's lampwork beads. A Little Underdone: a totally different look for my work, inspired entirely by Kimberly's fused glass focal. Working with both artists really made me stretch, finding ways to stay true to both of our artistic visions. And that I think, sums up one of the major reasons I'm back yet again, for yet another cup of soup. Oh I am so excited to see what you come up with! I have had the pleasure of meeting Judy in person last October when I traveled to WI. Judy is a very delightful woman with lots of lovely creative ideas. I do know that she is excited to be your bead soup partner. 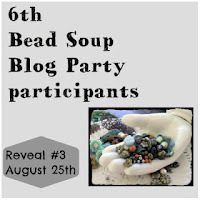 I am looking forward to seeing what the two of you create with each others bead soups. I love the teaser picture. It is a lot of fun to play with the photo effects. Oh and one more thing. The day I met Judy she was wearing that necklace and it is very pretty and looks nice worn. 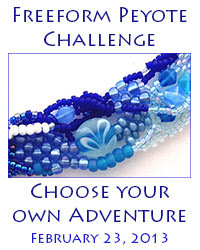 Judy's beads are amazing Karen -- I can't wait to see what you both design for this Bead Soup exchange!! Thank you so much Karen! I hope your soup arrives to you soon, mine came today! It is absolutely, positively wonderful! I am so excited to begin creating and you were very generous! I'll be posting a picture in the next few days for everyone to see. Therese - you are so lucky! I have yet to actually meet any of the lovely people I've met online. JJ and Kristen thanks for your confidence, and Judy - I am soooo glad you liked what I sent! I put it together as a little collage on my work table and kept adding til it 'looked right'. 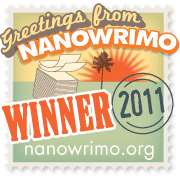 Bobbie - I hadn't realized that we'd met so recently! You must have been surprised to see my normal work if that was your introduction - Sea Chain is the most geometric piece I've ever done (still working on the title).